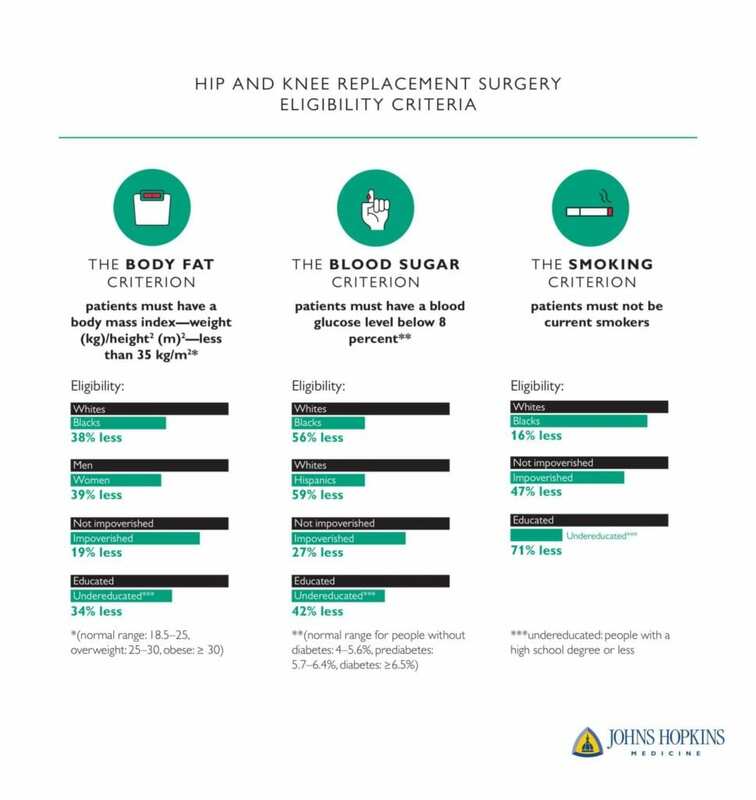 In a study of medical records pulled from a national database, Johns Hopkins Medicine researchers have found that underrepresented populations are less likely than others to be eligible for hip or knee replacement surgeries because they do not meet certain rigid–and in their opinion unfairly applied–hospital requirements for surgery, such as weight, blood sugar and tobacco use limits. Such cutoffs, say the researchers, designed to lower costs and in some cases complications, deny minority and lower income groups access to treatments that would improve their quality of life. According to the data from Nationwide Inpatient Sample, a database operated by a public/private partnership, more than 1 million hip and knee replacement surgeries are performed annually in the United States. These surgeries have been shown overall to improve health and patient quality of life, because people with untreated knee and hip problems are in more pain, are less mobile and less able to work in or out of the home. Humbyrd says that in an effort to cut costs and improve quality, hospitals set up eligibility criteria to prevent surgeries that statistically have worse outcomes and are considered high-risk. The criteria tend to exclude those diagnosed with at least severe obesity (a body mass index over 35), people with high blood sugar levels determined by hemoglobin A1C levels more than or equal to 8 percent, and smokers. Because these risk factors are usually more prevalent in already disadvantaged populations, the researchers aimed to measure how these inflexible cutoffs would worsen health disparities, and to identify the disadvantaged groups affected. Researchers collected information from 21,294 adults over the age of 50 from data already gathered for the National Health and Nutrition Examination Survey (NHANES). The average age of the participants was 66, and 51 percent were women. Non-Hispanic whites made up 52 percent of the participants, and non-Hispanic blacks and Hispanics each accounted for around one-fifth of the participants. The researchers examined how surgical eligibility criteria¾BMI, blood sugar level and smoking status¾changed who might be considered eligible for these surgeries. The researchers didn’t know if the people needed hip or knee replacements or whether they ultimately got them as the survey wasn’t set up to monitor for this. They applied the eligibility criteria to the whole population in the NHANES data and then analyzed how eligibility was distributed across racial and ethnic groups, males and females, people with an annual household income below or above $45,000, and people with an education level below or beyond high school. The results showed that those who met cutoff factors tended to have higher incomes, more education and be white. For example, using the cutoff of allowing only those with a BMI under 35 to have surgery resulted in African-Americans being denied 38 percent more often than whites. Overall, women were 39 percent less likely to be eligible than men. People with household incomes less than $45,000 were 19 percent less likely to receive surgery than people with higher income, and people with a high school degree or fewer years of education were 34 percent less likely to be eligible for the surgery than people with more education. When using the 8 percent cutoff for hemoglobin A1C, African-Americans and Hispanics were half as likely to be eligible for the surgeries as white people. The 54 percent of people in the study population with household incomes lower than $45,000 annually were 27 percent less likely to be eligible for surgery than those with higher incomes. Those 81 percent of people who had not completed high school were less were 42 percent less likely than those with a higher education level. When excluding smokers from eligible patients, who made up 16 percent of the study population, African-Americans had a 16 percent less chance of being eligible than whites. Lower-income groups only had half the chance of being eligible for the surgeries compared with people of higher income. People with a high school degree or less had less than a third of a chance of being eligible than people with higher education. Humbyrd suggests that, instead of automatically excluding high-risk populations with inflexible criteria, there should be more of a precision medicine approach with conversations between doctors and patients on their individualized surgical risks and ways to manage them. For example, doctors and patients can work together to control blood sugar to achieve the targeted safe level before the surgery, and patients can refrain from smoking around time of surgery. Humbyrd advocates for preoperative optimization rather than strict cutoffs. The researchers acknowledged that the NHANES data are not limited to patients who would need hip or knee surgery. Future studies with data specific to populations seeking these treatments will provide more insight into the need for adjusting criteria. Also, they did not have data for certain groups of people, including Asians. Other researchers in the study were Abigail Y. Wang from Johns Hopkins and Michelle S. Wong from the U.S. Department of Veterans Affairs. This study was funded by the Johns Hopkins University School of Medicine Dean’s Summer Research Fund. Michelle S. Wong was supported by the Veterans Affairs Office of Academic Affiliations through the Veterans Affairs Health Services Research fellowship. COI: the researchers declared no conflict of interests.